Save the Chimps has sadly bid farewell to a beloved gentleman, Jack, who passed away on April 12, 2014 due to cardiac disease. Jack was born on November 20 or 21, 1980 at the Institute for Primate Studies (IPS) in Norman, OK to his parents Vanessa and Ali. 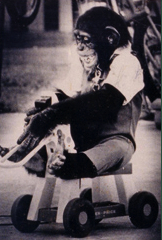 (Jack was a nephew to Nim Chimpsky, featured in the documentary Project Nim.) Jack’s birth name was Jacob, but over the years it morphed into Jack. Jack was transferred from Oklahoma to a circus act where he was trained to ride a tricycle. After Jack grew to be too large and dangerous for circus performances, he was sent to the Coulston Foundation, a research laboratory in Alamogordo, NM on August 12, 1989. A hand-written agreement stated that Jack was to be used as a breeder, and not be used for experimentation. That agreement was not honored. Jack was used in at least 5 different invasive research studies, and had multiple injections, blood tests, and biopsies. He also fathered one son, Taz. In September 2002, Jack’s years of exploitation finally came to an end. 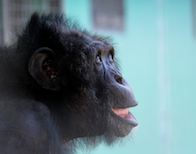 He was rescued when Save the Chimps took over The Coulston Foundation. Jack was one of more than 4 dozen chimps living in isolation in “The Dungeon,” a dismal building of gray concrete and steel. Having lived for years with no blankets, toys, or chimpanzee friends, Jack soon became known for his love of a large cozy nest of blankets, and for his friendly demeanor towards both his human caregivers and other chimpanzees. He became a member of Seve’s Family, and with them moved to Florida to enjoy a new life on a beautiful and peaceful island. One of our most treasured photos of Jack shows him moments after being released onto his new island home, gazing upwards with a look of wonder on his face. He had known nothing but four walls and caging for so many years, and we can only imagine what his thoughts were as he looked upon the three acres of grass and hills that lay before him. Jack embraced his new-found freedom to run and play, often engaging in a game of chase with his buddy Ricky. He was a beloved member of his chimpanzee family, and was like a father to Chelsea, who adored him. Jack was a charmer, and all if his caregivers were taken in by his expressive eyes and playful demeanor. He would nod enthusiastically in greeting whenever his caregivers arrived to serve his meals or clean his home. He liked to be sung to, and the tune “Jackie Blue” could often be heard when his veterinarian, Dr. Bezner, was around! Jack collapsed suddenly of heart failure while he was being served lunch by his devoted caregiver, Amber, in the company of his chimpanzee friends Anna and JR. Jack is deeply loved, and is deeply missed. Rest in peace and run free, dear friend.